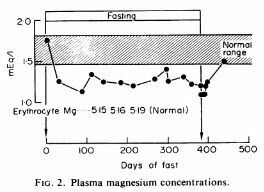 Here is a graph of magnesium levels for a man who went on 382 days of supervised fasting. So now we know that magnesium levels drop for people who go on a fast. To keep blood level magnesium up, I'll be taking magnesium supplements every day including fasting days. Just a note - if one's kidney function is impaired, extra magnesium can build up in the body. Magnesium overdose is dangerous. Probably not an issue with normal kidneys, unless one is taking megadoses. I'm into my 2nd day of fasting right now. -- (I would like to go 7 days...but there is a birthday party tomorrow at a new restaurant, and I don't know if I will hold out??!) -- I have a blood glucose monitor & finally figured out how to use it!